From the beautiful turquoise lake to the colorful old buildings of the Vieille Ville, Annecy has lots to see and do. When I mentioned to friends that we were going to Annecy, I often got the reaction, "Oh I love Annecy! It's so beautiful." Located on the lovely Lac d'Annecy and surrounded by mountains, Annecy enjoys a beautiful setting. With the lake, the Thiou River, and several canals, the town takes advantage of its waters. Some refer to it as the "Venice of Savoy." 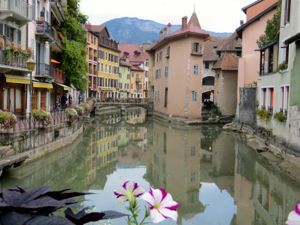 No matter when you visit Annecy, you can enjoy its fascinating history, beautiful architecture, and splendid natural setting. Above, Colorful old buildings line the canals of Annecy. 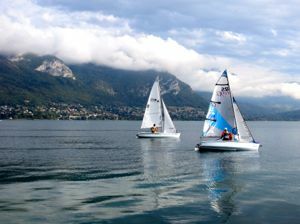 Below, Sailboats on Lake Annecy.